Earlier in the year, someone-or-other expressed their reservations about adding three teams to England’s four-day competition and dividing it into three divisions of seven. They said that it would be hard to maintain the quality. We can’t remember who it was, but this comment seemed to us to betray a fundamentally English county cricket attitude to English county cricket. Despite there being two divisions, some people still see it as all being the same thing, lumping first and second tier statistics in with each other. These people think that adding three smaller teams to a third division would therefore dilute first-class cricket. No it wouldn’t. What it would so is give rubbish third division counties a chance to play against teams who are of roughly equivalent standard. That’s what divisions are. They’re a hierarchy. On this site, we routinely ignore the second division. It’s not because we don’t care about it – because with Lancashire down there, we most certainly do. It’s just a reaction to the way cricket is covered elsewhere and a means of making an unwieldy competition fractionally more manageable. The newspapers that still run county cricket match reports pay little heed to the divisions. Most are more likely to cover a Surrey game than any other. Whether that’s because Surrey are a well-supported club, because they feature certain high profile players or simply because the journalist in question lives nearby, it’s the wrong way to report if the County Championship is to be considered a worthwhile entity in its own right. Even Cricinfo, who are generally pretty good about this sort of thing, lump first and second division matches in together in their live scores box in the sidebar. The county season is also unnecessarily complex and while some will say that complexity is a key part of cricket’s appeal, we’d argue that an already complex sport would benefit from an even more straightforward structure. County cricket hardly need worry about attracting dilettantes. It is hard for this writer to properly follow the ins and outs of an already complex sport across eight different matches spanning two divisions, particularly when half of the season’s fixtures run at the same time as Test matches. As all of our readers are also possessed of just the one brain, we figure it might be a challenge for them too, so we halve our subject matter by amputating the second division. Sport is about competition. It seems bizarre to give equal billing to sides regardless of performance. So we don’t. I’m quite happy to follow both divisions but I do see your point. A greater focus on the 1st division would be helped if Sky ever bothered to broadcast the matches on the television (this is a rant that could go on and on if you let me). My problem is that I support Surrey, and although statistically I cannot be the only one on this site that does I do feel admitting this is like living in Tunbridge Wells and confessing to a lifetime support of Manchester United but without the groaning trophy cabinet to support my choice. In my (modest) defence, I was born in South London and first new of the Oval as a tube station long before it was that place where Hashim Amla single handedly made a mockery of England’s test number 1 status (you know, 6 months after Saeed Ajmal did much the same). I laughed and laughed at this so-called defence of supporting Surrey. I too was born and raised within two or three miles of the Oval. I witnessed my first few glorious days of county championship and test cricket there. But never, ever, ever, did I stoop to supporting Surrey, Alec. You’ll need better excuses than those. Um, I also used to bump into Alec Stewart as a child without knowing at all who he was as he lived a few doors away from my Grandmother. I’m sure I have a better reason… Until then, maybe. I should support Northamptonshire, who are based near where I live now. As with all sports, I only care about the one the team from Leicester (or Seattle) is playing in. I haven’t paid attention to the first division since 2003. Yes, Washingtonshire’s demotion from first division cricket does seem rather permanent right now. You don’t want to watch the Microsoft Djangos take on the King County Kings? King County Cricket Kings, surely. King Cricket’s King County Cricket Kings of Cricket Kings XI Bothell. Meanwhile Middlesex seem set to continue their considerable run of form, and crash out to Somerset on the most roadly of roads. Either that or Sam Robson will suddenly find form and score a double-hundred. Pfft. He’s not even as good as his brother. Speaking of whom, I see Leics are all set to make a pig’s ear of their best chance to win a game in years. All out by tea tomorrow, lose by 150 runs? All five results still possible at Taunton, Balladeer. Remember Lord’s v Yorkshire last season! Bizarre match with record-breaking partnerships and then mega collapses aplenty. A road with potholes, perhaps. Very unpredictable, although runs on the board look preferable, granted. Not quite, Daneel, but a pig’s ear was made nonetheless. And Cobb scored runs. Bah! At least the Australians were as rubbish as everyone else. Speak for your own team. Voges did a blinder. Not sure whether to be delighted or distraught. Try being a Kent fan. We haven’t got past 300 for eons. I can think of 6 possible results for the game at Taunton. There may be a 7th if Godzilla invades the ground and eats all of the players. I’m sure some-one on here can advise me on that one. I can’t believe I’m about to suggest this but maybe the americans are on to something by organising their competitions into ‘conferences’. Teams could play every other team in their conference and a certain number of games against teams in the other conference (fixture of the inter conference games to be based on their finishing position within their own conference the previous season). You would be able to assess the relative strengths of all the players in the competition, revenue would be shared around a little better and even the lower ranked teams would have a chance to play in winnable games. You could even have a ‘finals’ series of two conference championship games and a grand final. It bores me to tears in baseball – admittedly, 162 games a year is ludicrous to start with, but 80 of them being against the same 4 sides is dreadfully repetitive. Oooh, it’s the A’s again. How exciting. I must watch them for the 10th time this year. The game itself is good, but a shorter, more intense season would make a lot more sense. American football however, works really well (apart from all the brain injuries, obviously) – the best teams still rise to the top, the sharing of the pot and the draft system helps to keep things fairly even, and the really short season keeps everyone interested. So in cricket, what? 2 divisions of four, 2 of five, grouped regionally – something like this? Perhaps promote a couple of minor counties to even things up? Devon, Staffordshire? 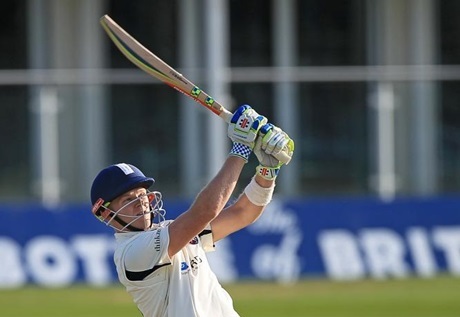 Have a draft for players from the MCCU sides? You should try following the Ranji Trophy! Not even Indians claiming to follow domestic cricket can name all 27 teams. 3 groups of 9 teams each with group C the equivalent of II division, with the top two teams not only qualifying for knockouts but ‘promoted’ to replace the bottom placed teams from groups A and B the next season. The top 3 teams from groups A and B qualify for the knock-outs along with the 2 from group C. The knock-outs hence feature Quarter-Finals, Semi-finals and the finals. Each of the 9 rounds at the league stage features 24 teams in 12 games. However at 115 games each season it is still more compact than the LVCC! Whenever the Indian team loses a test series, the media is full of critics calling for reducing the number of teams to ‘improve’ competitiveness and raise the general standard of cricket played in the tournament. In my opinion this is a load of bull. The traditional Indian way of tackling a problem is to throw more manpower at it, not less! :-). Seriously though, large swathes of India remain unrepresented in the Ranji trophy. Bihar state for example is only an associate member of the BCCI despite a population of 104 million in 2011. Almost the entire North east remains unrepresented too. Finally, the Duleep trophy inter-zonal tournament with players drawn from 5-6 Ranji Teams in each of the 5 Zonal teams participating in the tournament should be enough to provide tougher standard of cricket for the better domestic players. I love the fact that one of the teams in this competition, the teams for which are almost all location-based, is called Railways. It would be a bit like the County Championship having one team named “no fixed abode” or something. Railways and Services are the Institutional teams – the former is part of Central Zone and the latter is part of North Zone in the Duleep trophy. However both have their home grounds in Delhi which is in the North Zone! They are from the amateur era when cricketers needed to hold down jobs other than playing cricket to make a living. Both, the Railways and Services employed huge numbers amongst whom were enough good cricketers to form a first class squad. It made sense for the BCCI to encourage to employ cricketers by allowing them to field a team in the Ranji Trophy. Tripura is derived from Tripuri Dynasty (Sanskritised version of Twipra Dynasty) which seems to have ruled from 1280 AD till 1949 AD. The North Eastern States (population in millions in 2011 in brackets) apart from Assam (31.17) and Tripura (3.67) are Arunachal Pradesh (1.08), Meghalaya(2.96), Sikkim(0.60), Nagaland(1.98), Manipur (2.72) and Mizoram (1.09). All have cricket Associations affiliated to the board as associates/affiliates rather than full members. Not many from the North East get into Railways and Services either. Rongsen Jonathan of Railways is the only one I can think of.